Just in time for Valentines, and to spread just a little more love around the world. A free pattern for you all. 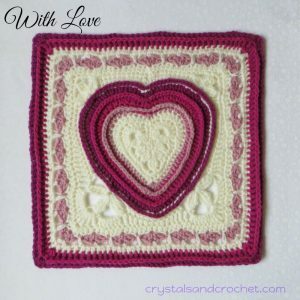 I suppose this should really be called Ashley’s Heart, as my superstar tester Terena asked me to design this square for a blanket she is making for her granddaughter’s special birthday. And I know that is what Terena is calling the square. My reason for calling it With Love , is because I love designing, and I love that so many of you love my work, so it’s all about the love. Which, after all, is all that really matters in this life. There is a download at the end of the pattern, please feel free to print it off and keep it. But, as all of my patterns are copyright , if you wish to share the love with others, please give them a link to send them here to download for themselves. I used Stylecraft Special double knitting with a 4mm hook. Colours: Cream, Pale Rose, fuchsia Purple, and Boysenberry. Dc Cluster: Yarn over, place hook in stitch to be worked and pull up a loop, 3 loops on hook, yarn over and pull through 2 loops, 2 loops on hook. Yarn over, place hook in same st, pull up a loop, 4 loops on hook, yarn over and pull through 2 loops, 3 loops on hook. Yarn over, place hook in same st, pull up a loop, 5 loops on hook, yarn over and pull through 2 loops, 4 loops on hook. Yarn over and pull through all 4 loops. To make a starting cluster, simply start with a standing dc or ch 3 as your 1st st.
Tr Cluster: Yarn over twice, place hook in stitch or space to be worked and pull up a loop, 4 loops on hook, yarn over and pull through 2 loops twice, 2 loops on hook. Yarn over twice, place hook in same st/sp, pull up a loop, 5 loops on hook, yarn over and pull through 2 loops twice, 3 loops on hook. Yarn over twice, place hook in same st/sp, pull up a loop, 6 loops on hook, yarn over and pull through 2 loops twice, 4 loops on hook. To make a starting tr cluster, simply start with a standing tr or ch 4 as your 1st st.
Dtr Cluster: Yarn over 3 times, place hook in stitch or space to be worked and pull up a loop, 5 loops on hook, yarn over and pull through 2 loops 3 times, 2 loops on hook. Yarn over 3 times, place hook in same st/sp, pull up a loop, 6 loops on hook, yarn over and pull through 2 loops 3 times, 3 loops on hook. Yarn over 3 times, place hook in same st/sp, pull up a loop, 7 loops on hook, yarn over and pull through 2 loops 3 times, 4 loops on hook. Split shell: 2 dc, ch 1, 2 dc, made into same stitch or space. Long sc: Insert hook into stitch or space one or more rounds below next st as instructed and pull up a loop to level of current round, then yarn over and pull through both loops on hook. 1. Starting with a magic ring, make 12 sc into ring. cluster), skip next 3 sts, in next st (dc, cluster, ch 3, tr cluster, ch 3 , dc cluster), skip next 3 sts, in next st ((dc cluster, ch 3) twice, dc cluster), skip next st.
Stitch count: 8 dc cluster, 1 tr cluster, 6 ch-3 spaces. in next cluster [tr cluster] (sc, hdc, sc), 3 sc in next ch-3 space, sc in next 2 clusters, in next ch-3 space (2 sc, hdc), skip next cluster, 9 dc in next ch-3 space. Stitch count: 16 sc, 3 hdc, 18 dc. 4. Ch 1 and sc in same st, sc in next st, hdc in next st, 2 dc in next 5 sts, dc in next st, hdc in next st, sc in next 9 sts, in next st (hdc, ch 1, hdc), sc in next 9 sts, hdc in next st, dc in next st, 2 dc in next 5 sts, hdc in next st, sc in next st.
Stitch count: 21 sc, 6 hdc, 22 dc, ch-1 space. Hint: you may find it helpful to place a stitch marker in the ch-1 space, at the point. 5. Join with a standing dc in ch-1 point space, (dc, ch 1, 2dc) in same space, dc in next 14 sts [be careful not to miss the 1st st after ch-1 space], 2 dc in next 6 sts, dc in next st, hdc in next 2 sts, sc3tog over next 3 sts, hdc in next 2 sts, dc in next st, 2 dc in next 6 sts, dc in next 14 sts. Stitch count: 1 sc3tog, 4 hdc, 58 dc, 1 ch-1 space. 6. Join with a standing bpsc around sc3tog, bpsc in next 31 sts, ch 1, bpsc in next 31 sts. Join to standing bpsc with a sl-st.
in ch-1 space (2 dc, ch 1, 2 dc), dc in next 20 sts, 2 dc in next 9 sts, dc in next st, hdc in next st.
Stitch count: 1 sc, 2 hdc, 82 dc, 1 ch-1 space. 8. Join with a standing bpsc in last dc, bpsc3tog over next 3 sts, bpsc in next 41 sts, ch 1, bpsc in next 40 sts. Stitch count: 82 bpsc, 1 bpsc3tog, 1 ch-1 space. dc in next 25 sts [be careful not to miss the 1st st after ch-1 space], 2 dc in next st, dc in next st) 7 times, dc in next st.
Stitch count: 1 sc, 2 hdc, 98 dc, 1 ch-1 space. 10. Join with a standing bpsc in last dc, bpsc3tog over next 3 sts, bpsc in next 49 sts, ch 1, bpsc in next 48 sts. Stitch count: 98 bpsc, 1 bpsc3tog, 1 ch-1 space. sc in next 16 sts, skip next 3 st, in next st ((tr cluster, ch 3) twice, tr cluster), skip next 3 sts, sc in next 10 sts. Join to sc3tog with a sl-st.
Stitch count: 64 sc, 6 tr clusters, 6 dtr clusters, 4 ch-3 spaces, 4 ch-4 spaces. careful attention to your stitch count and placement. [side 1 cont] 3 sc in next ch-3 space, skip next cluster, sc in next 10 sts. Stitch count: 29 sts per side, plus 1 corner st.
13. Ch 1, hdc in next 14 sts, (in corner st (2 hdc, dc, 2 hdc), hdc in next 29 sts) 3 times, hdc in next 14 sts. Stitch count: Per side: 33 hdc, 1 corner dc. Repeat from * to * 4 times, omit last corner split shell st.
Stitch count: Per side: 6 sc, 5 split shells, plus 1 corner split shell. Stitch count: Per side: 7 sc, 6 long sc, 12 ch-2 spaces, 1 corner ch-1 space. Hint: you may find it helpful to place a stitch marker in the ch-1 corner spaces. Repeat from * to * 4 times. Stitch count: Per side: 37 hdc, 1 ch-1 corner space. Stitch count: Per side: 38 dc, 1 corner tr. Repeat from * to * 4 times, omit last bpdc. Stitch count: Per side: 2 hdc, 38 bpdc, 1 corner dc. Here are some of the squares made by my testers. Amanda used Stylecraft Special DK in shades: white, lavender, magenta and silver. With a 4.5mm hook and the square measures 28cm / 11in square. Svetlana used Sunny by Vita Cotton in shades: White, Green, Mint, Yellow and Blue. With a 3mm hook and the square measures 23cm / 9″ approx. Subscribe to my website, to keep up to date with all my designs. Hi, it is exactly the same as doing a sc3tog except you do it around the back of the post not in the top of the st.. Thank you for this lovely heart! Planning to make a baby blanket, how to crocket hearts together? Waiting for your answer, thank you! Helen, Thank you so much for another beautiful pattern! I can’t wait for the CAL Your work is outstanding and thank you for sharing it. Thank you for another beautiful pattern, I can’t get enough of them !!!! I tried visiting Deramores through your link and it did not work. The Wool Warehouse one works fine, but not Deramores. Just thought I’d let you know.